If you have a motorcycle, you already know the benefits. You save money on gas, enjoy the open air, and relish other aspects of owning a motorcycle. It is important, however, not to forget that riding a motorcycle comes with dangers as well. Compared to cars, motorcycles provide less protection in the event of a crash. They are smaller than other vehicles and do not provide as much protection. Since there can be more risk involved in the event of a crash, it is important to have as much information about the accident as possible. Every year, the National Highway Traffic and Safety Administration (NHTSA) provides motorcycle accident statistics for each state. Georgia’s motorcycle crash statistics raise awareness about the number of people killed in crashes, indicates causes of accidents, and provides insights into common dynamics of accidents, the age groups most impacted by crashes, and other risk factors. In 2012, there were 134 motorcycle fatalities in Georgia according to the NHTSA. This is a little under the average of the previous five years (152 fatalities per year), but is within the normal range. Unless there is a drastic change, the number of fatalities will likely remain around this average in the future. Eight of these fatalities were due to the fact that the motorcycle driver was not wearing a helmet. Despite the fact that helmet and goggle use is required by law in Georgia, every year there are several deaths that could have been avoided if helmets were worn properly. Each year, an estimated average of 79 lives are saved in serious accidents by wearing helmets on motorcycles. This shows how important it is to wear a helmet every time you are riding on a motorcycle. Most motorcycle fatalities occurred in Dekalb and Fulton counties. The majority of victims were males between 20-39 years old. Young men are particularly at risk for motorcycle related injuries and fatalities. There are several common reasons that the NHTSA identifies as causes for many fatal accidents. The first underlying cause is alcohol. Not only is driving under the influence cited as one of the most common causes of accidents in Georgia, but statistics show that the percentage of intoxicated motorcyclists involved in fatal crashes is greater than the percentage of intoxicated drivers of passenger vehicles involved in fatal accidents. Studies show that in the majority of multi-vehicle motorcycle accidents, the driver of the passenger vehicle is at fault. The NHTSA reports that in 38 percent of multi-vehicle motorcycle crashes, the vehicle was turning left while the motorcycle was going straight, overtaking another vehicle, or passing. In almost all cases, the turning car is at fault in these accidents. If visibility is low, it becomes even more difficult for drivers to see motorcycles, causing further accidents. Speeding is a serious cause of motorcycle crashes in Georgia. The NHTSA indicates that an average of 35 percent of motorcyclists involved in fatal accidents are speeding, compared to 22 percent of drivers in passenger vehicles. This shows that risky driving behaviors may be more common on motorcycles, especially certain models like sport or super-sport motorcycles. 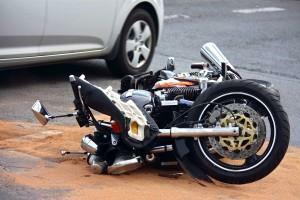 In general, motorcycle accidents have the potential to be more catastrophic no matter what kind of accident. This means it is even more important for motorcyclists to take appropriate precautions and follow safety laws. Sometimes, despite even the most careful precautions, motorcyclists can be injured in a crash. In this situation, it is very important to know the facts about your situation. If you or a loved one has been in a motorcycle accident, you may have already found out firsthand how much information you must sift through to get a settlement. At Van Sant Law,, we are Georgia motorcycle accident injury lawyers with years of experience that give us the knowledge we need to make the process smoother and faster. Fill out our free, no-obligation online contact form, or call us today at (404) 991-5950 for a free case evaluation to take advantage of our expertise and get the law on your side.